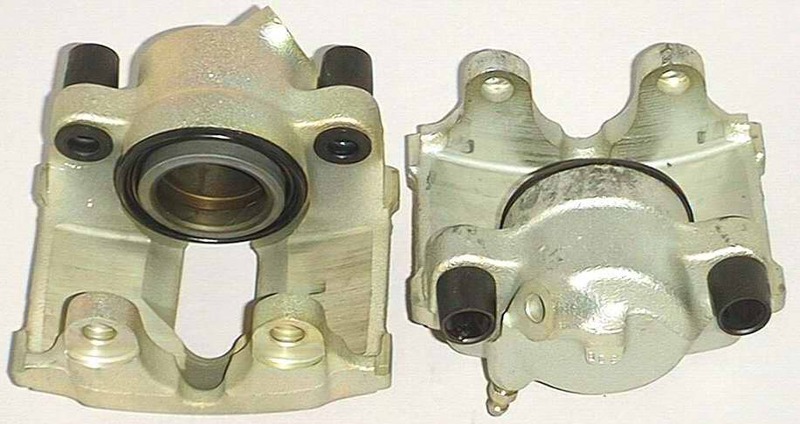 98 Outback: single or dual piston calipers? us about $700, our automotive life has only continued to improve. He had so much fun doing that, I gave him an adult education auto shop course for Christmas. It's the best kind of course we could have imagined: 3 hours per week doing hands-on work in a nicely-equipped garage on your own car or those of fellow students. And where I had worried that my 49yo husband would be the oldest student by far, he thinks he may be the youngest! His next project is replacing the front rotors and pads on the Outback. He went to the parts store to buy this stuff and was asked if his front brakes have single or dual piston calipers. How can he figure this out? According to this; http://www.cars101.com/outback_archive98-99.html it's dual piston calipers on the front. Alternatively, have him ask for both sets and then, after he inspects the old pads, he will have the correct ones there and can return the incorrect ones. The parts store should have no trouble refunding him for unused mechanical parts. There's something fundamentally satisfying about doing things yourself; confidence building kinda. Mmmmm, the calipers. You can tell by looking at the back of the caliper; the dual piston ones have a double curvature to them that the single piston ones don't. But rather than rely on this, I would suggest that you actually rotate the caliper away from the rotor, and take a look. You will see either one large piston, or two smaller ones. Jack whichever front wheel happens to be in the sunshine, fit a jackstand for safety, and remove the wheel. If you look at the caliper assembly, you will see that it is mounted to a heavy steel frame/carrier/whatever-ya-call-it, which is in turn bolted to the hub with two hefty (17mm head) bolts. These are (or should be) really tight, and rather than mess with them, what you want to do is remove one (I think the lower one works best, but can't recall for sure; if one doesn't seem like it's working right, try the other) of the smaller bolts that hold the caliper body to the frame, and then pivot the caliper up off of the rotor. The pads will stay with the carrier. 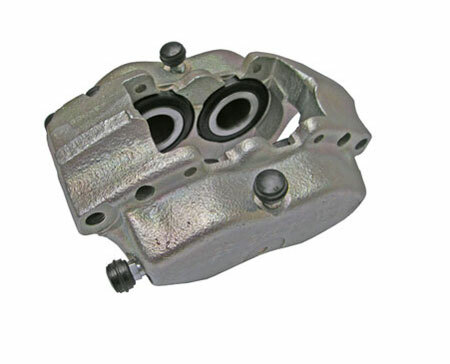 On the inboard side of the caliper you will see one, or two sorta cup-shaped pieces, surrounded by a rubber boot. These are the pistons that press the pads together when the brakes are applied Note the shape of the back of the caliper roughly replicates the piston arrangement. Next time, you will be able to tell at a glance. The arrangement of bolts thru sleeves and bushings is what allows the caliper to "float" as the pads wear. Everything here should be clean and nice; (not gritty or rusty. a little clean grease is desirable) the little rubber boots should be intact, and the sleeves should slide smoothly in their associated bushings. Likewise, the rubber boot surrounding the piston(s) should be in good shape without any tears or cracks. There should be at least 1/4 inch of material left on the pads, and it should be worn evenly across the pad, and from one to the other. The surface of the rotor should be reasonably smooth, and not heavily worn down where the pads grip. Slide the caliper back over the pads, replace the bolt, and put the wheel back on. This sounds like a lot, but in reality, it probably takes less time to do it than to tell about it. The new pads will be thicker than the ones being replaced. This means the caliper pistons will need to be compressed to install them. Crack the bleeder valve and use a large screwdriver to push against the old pads before removing them. This will force the pistons back into the bores. I would recommend using OEM brake pads. Just not worth the few dollars saved using cheap auto part store pads. Might be a good idea also to replace the rotors if the car has a lot of miles on it. Rotors held in place by two small screws that almost always are a bear to remove. Something called an impact screwdriver is your friend here. It is a screwdriver that you whack with a hammer. If you end up rounding the heads of the screws that hold the rotor, just drill the heads off. Screws not really needed as the wheel will hold the rotor in place when mounted. A note of caution: If you undo the bleeder valve to make pushing back the pistons easier make sure you don't let any air into the system otherwise you will get spongy brakes and have to bleed the whole system. Not a 'big' problem, just creates a little more stuffing around and a pain in the posterior. Can I put 05' Legacy Rims on 94 Legacy? Single vs Dual Piston Calipers?? Brake design question - Ray? Anyone? $30K CASH TO SPEND ON A TRUCK WHAT SHOULD I GET? Q: new shocks/struts - when? 2005 Silverado: Rear Drum Brakes ?